Only minutes walk to the world famous sands of Clearwater Beach, our affordable 3-bedroom, 2-bath, private-pool beach rental will satisfy everyone in the family. 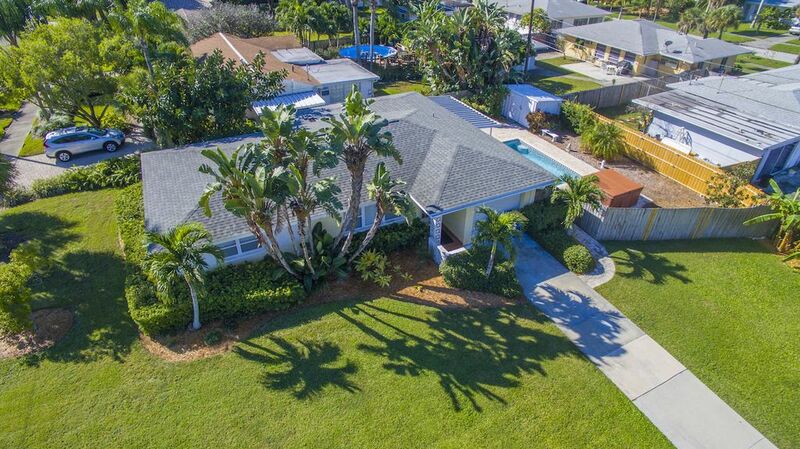 This completely renovated classic Florida home books early so plan ahead to avoid missing out. Built in the 1960s the adorable Gardenia Hideaway cottage is one of our most popular properties for several reasons. The beach home boasts a prime location and high quality renovations. Comfortable beds, a modern sleek kitchen and upgrades throughout also make this private-pool and hot tub home a family pleaser. The trolley stops right in front of the house so some groups do not even rent a car when staying at this cute north Clearwater Beach home. Look for last minute special prices on cancellations. Please check our calendar on this site for real time availability and to hold the house online. Online bookings do get preference. Lowest prices in Sept., Jan., Oct., and Nov.
Our beach rental house is set up for a family of 8 with a strict maximum of 10, if your own sleeping bags or air mattress. Everyone will appreciate the quiet yet convenient location near the beaches, downtown Clearwater, Pier 60, upscale shopping, and great restaurants. The strict non-smoking beach house offers a full kitchen, wireless internet, flat screen TVs in each room, and a private laundry room. Bed linens and bath towels are provided for the three well-appointed bedrooms with 2 kings, 1 queen and pullout couch. Nice place for a family to stay. Great location walking distance to beautiful private beach. This was the first time I rented a home. The experience was wonderful and I will never go back to hotels. The home was very clean and well stocked with cookware and utinsles. We were unable to connect to Wi-Fi. Cell service was spotty at times with Tmoble and data was slow without Wi-Fi. My husband and daughters legs were bitten up by some type of insect while sitting out at the pool. My husband's legs had over 50 bites on them we stopped counting. Maybe there is something that can be sprayed out on the patio to combat this problem? Some of the locals said it may be sand fleas and we never stepped foot on any of the beaches. The back bedroom off of the kitchen has an attached bathroom which was great but the bed was a queen or full size because of the smaller room. The mattress was too soft for our liking but what are you to do? The other two bedrooms had King size bed and were large rooms those beds were very nice but they shared the hall bathroom which other reviewers have commented about being outdated which was the case during our stay. Great rental for our young family. We really enjoyed the heated pool and hot tub in the backyard. It was easy to walk the short distance to the beach. The rental had beach towels, beach toys, beach chair and a cart to carry things to the beach. The kitchen was well stocked and we were able to use the pack n'play and high chair. Lots of great restaurants to choose from. We had fun exploring around Pier 60 and watching the entertainment at their daily Sunset Festival. The Clearwater Marine Aquarium is not very far. There is a nice local Publix grocery store nearby to get anything you might need for your stay. We loved our visit to Clearwater and would recommend this rental. The rental property was in a nice, quiet location and a short walking distance to public access beach. The overall house was clean BUT it was in need of a good cleaning i.e. windows were filthy, any air duct was dirty with dust and a dark material (mold? ), shower curtain had mold on it. We paid $80 for heat for the pool and hot tub but the pool was not heated. I discussed this with Allan, the property manager on day 1 of our stay and he said he would send someone out to fix it. The maintenance man came but wasn't able to fix it so we did not get to use the pool at all during our stay. I asked for a refund but have yet to hear back from Allan. The beds were comfortable and furnishings nice but I would look around for something a little better and would probably not rent this location again. Great location! Easy walk to the beach & not far from Publix & local seafood. Very clean.loved the kitchen.hot tub took time to heat up. Recommend updating the master bath & providing at least 4 beach chairs (since we flew in & couldn't buy them). Appreciated having beach towels for the hot tub/pool. Overall - wonderful house!!! Beds are comfortable!! Loved clearwater! Would stay here again!